Commuters faced delays on their journey home after a fire near railway lines in south-east London affected services. Passengers travelling in and out of London Bridge were warned of 30 minute delays after two explosions at an industrial site in Deptford. The blaze, which broke out in the early hours of Thursday, involved gas cylinders and forced 200 residents to leave their homes. Many have returned - but up to 100 face another night in temporary shelter. Services into London Bridge, Cannon Street, Waterloo East or Charing Cross were cut earlier in the day. Train services have since resumed on all routes. 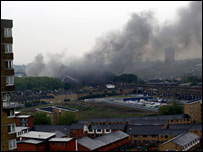 The London Fire Brigade said the blaze had engulfed about 75% of a two-storey warehouse on the site. The fire started in the early hours of Thursday at Canal Approach. The London Fire Brigade said a number of unknown gas cylinders were involved in the blaze. About 50 firefighters and 10 fire engines attended the incident. Lewisham Council said residents who needed accommodation were housed in a hotel in Blackheath. As of Friday afternoon, a council spokeswoman said a final all-clear had still not been given by London Fire Brigade, and some residents could not return to their homes. A fire has destroyed and industrial estate.